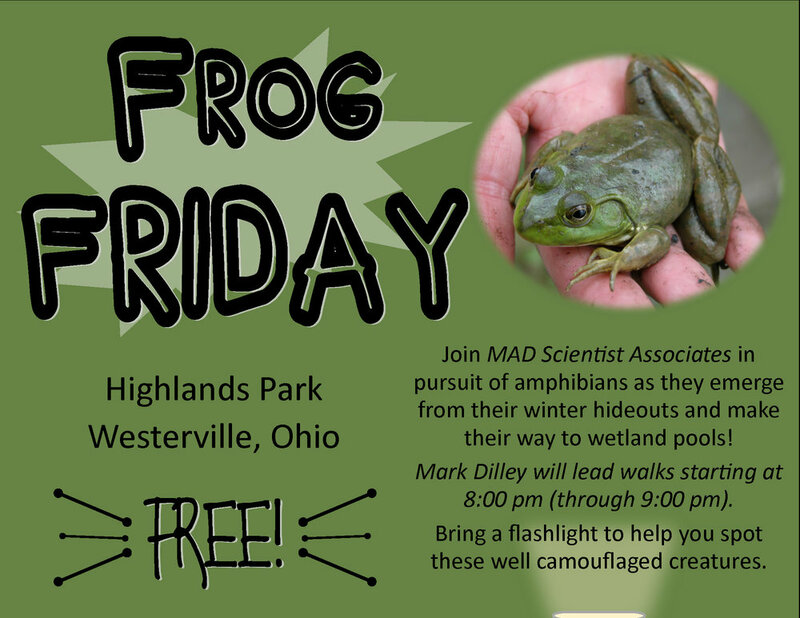 Join us in celebration of World Wetlands Month by attending our annual Wetland Workshop at Highlands Park in Westerville! We'll have hands-in exploration activities, local wetland wildlife to view, and children's crafts. If you’d like to participate in the online scavenger hunt, download the Scavify app (for free) and search Wetland Workshop in Westerville. Join us for another Frog Friday! We will meet at the Highlands Park Wetlands at 7:30 p.m. for a short presentation followed by ample exploration time (until around 8:30 p.m.). If you want to test your frog catching skills, nets will be provided. We suggest you wear old shoes and dress for the weather. We hope to see you then! Join us at Boyer Nature Preserve Saturday, October 27th, for our annual invasive species removal event. Celebrating 20 years of MADness! Join us for our last Frog Friday (another freaky opportunity!). We will meet at the Highlands Park Wetlands at 8:00 p.m. for a short presentation followed by ample exploration time (until around 9:00 p.m.). If you want to test your frog catching skills, nets will be provided. We suggest you bring a flashlight, wear old shoes and dress for the weather. We hope to see you then! 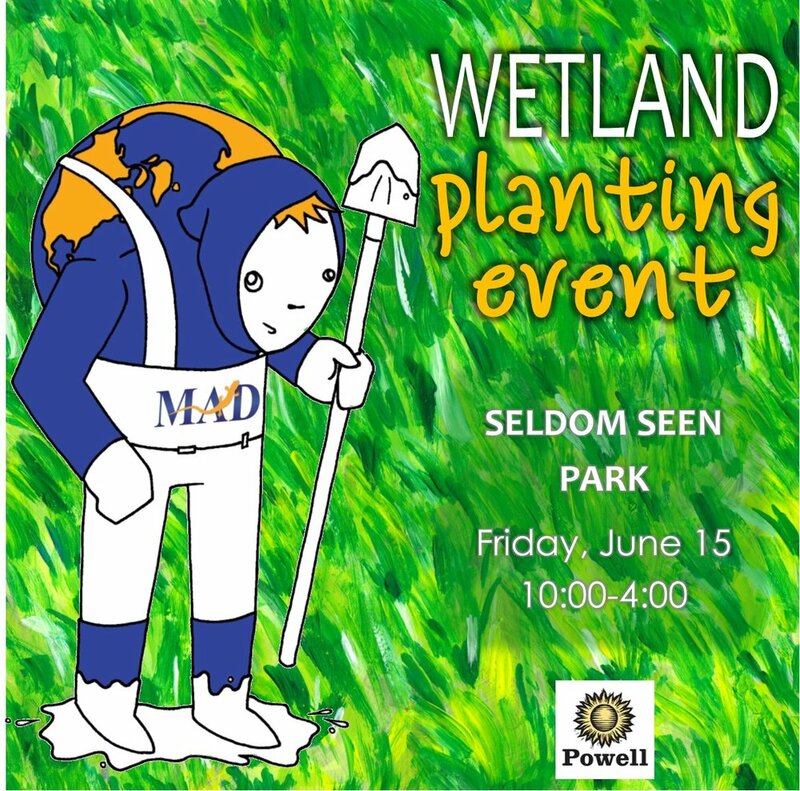 Help MAD Scientist Associates and the City of Powell plant the newly enhanced wetland area at Seldom Seen Park! We have thousands of native wetland plugs and bare root shrubs to install, so any extra hands will be appreciated. The park will be muddy, so wear boots if you have them. We'll provide gloves, tools, and refreshments. Park along the service drive that parallels the railroad (see link below). If construction is delayed due to weather this week, we will reschedule this event for the following week. Email Jenny (jennya@madscientistassociates) if you have any questions. Activities are family friendly. Come anytime between 10:00 am and 4:00 pm. Join us for another Frog Friday! We will meet at the Highlands Park Wetlands at 7:30 p.m. for a short presentation followed by ample exploration time (until around 8:30 p.m.). If you want to test your frog catching skills, nets will be provided. We suggest you bring a flashlight, wear old shoes and dress for the weather. We hope to see you then! Want to get back to nature and celebrate Earth Day? Join MAD Scientist Associates in supporting the City of Columbus. They will be creating a park on Central College Rd., featuring a nature preserve and natural play area. During this event, we will be planting trees to expand the mature forest already located onsite, increasing wildlife habitat and providing additional benefits for stormwater, air quality, and property values. Come prepared for muddy conditions! Shovels will be provided, but they may be in short supply--we encourage volunteers to bring their own. Water and snacks will also be provided. Park in the parking lot of Quest Community Church (4877 Central College Rd.). The tree planting will take place on the property to the west (signs will be posted to direct to site). On Saturday, October 21, MAD Scientist Associates will be working with the City of Westerville Parks & Recreation Dept. and FACT to host the annual Make a Difference Day event at Boyer Nature Preserve in Westerville, Ohio. Seed Saturday at Highlands Park Wetlands! Mark your calendars! Saturday, October 7th, we'll be hosting a seed collection event at the Highlands Park Wetland. The City of Westerville has agreed to share some of the native goodness growing at Highlands so that you can start your own wild gardens at home! Join us for our 5th Frog Friday program! We will meet at the Highlands Park Wetlands at 7:45 p.m. for a short presentation followed by ample exploration time (until around 9 p.m.). Join us for our 4th Frog Friday program! We will meet at the Highlands Park Wetlands at 7:45 p.m. for a short presentation followed by ample exploration time (until around 9 p.m.). Wetland Weekend 2017 - Join us! Join the Westerville Parks & Recreations Dept. and MAD Scientist Associates for its 17th annual Wetland Workshop on Sat., May 20 from 10m to 12 noon, preceded by a Frog Friday on May 19, the night before for an evening preview. Frog Friday #2 of the 2017 Frog Season. Meet at the Highlands Park Wetland at 7:45 p.m.
Spring is here! With that, we will be resuming our popular Frog Friday programs. Beginning Friday, April 14, we will meet at the Highlands Park Wetlands at 7:45 p.m. for a short presentation followed by ample exploration time (until around 9 W.m.). If you want to test your frog catching skills, nets will be provided. We suggest you bring a flashlight, wear old shoes and dress for the weather. We hope to see you then! Check our Volunteer & Events frequently for other Frog Friday dates throughout the spring. Thanks to the Westerville Parks and Recreation Department for supporting this fun and educational event! On Saturday, October 22, MAD Scientist Associates will be working with the City of Westerville Parks & Recreation Dept. and FACT to host the annual Make a Difference Day event at Boyer Nature Preserve in Westerville, Ohio. We'll be continuing the battle against invasive species in the Preserve, mainly targeting bush honeysuckle. Planting native trees and shrubs in the place of the non-native plants we remove will be our focus. The event will run from 9:00-12:30. You'll have plenty of time to nap before the OSU game at 8:00pm! Mark Dilley will be the morning speaker for Flora Quest 2016. His talk is entitled Wetland Plants: Twenty to Thrill, Five to Kill - a must attend opportunity! Local expert Jim McCormac will talk about Lake Erie: Ohio's North Coast and refuge manager Jason Lewis will share about the Ottawa National Wildlife Refuge: Conserving the Future and Connecting People to Nature. Less than 48 hours until our next Frog Friday! Meet at the Highlands Park wetland in Westerville at 8 p.m. ("formal" program to begin at 8:30). Bring a flashlight if you want to explore the wetland edges after dark with a MAD Scientist! MAD will be at Party at the Creek! Party at the Creek returns tomorrow, May 26 from 6-8 p.m. at Alum Creek Park North, 221 W. Main Street. Featuring tours of scenic green spaces and waterways, canoeing, food and entertainment, Party at the Creek showcases the natural treasures of our local environment in community block-party style. MAD Scientist Associates will bring some nature to you with close up views of critters from Alum Creek. Look for us! Join the Westerville Parks & Recreations Dept. and MAD Scientist Associates for its 17th annual Wetland Workshop! This FREE, fun, family-oriented workshop will be led by local Professional Wetland Scientist, Mark Dilley. Exploration stations will be set-up along the Highlands Park walking path where attendants can learn about different aspects of wetland life, make fun crafts, and even get in the water to look for aquatic wildlife! Mark your calendars, we'll be running our final FROG FRIDAY at Highlands Park on May 20 from 8:00 - 9:00pm! Mark has reported two new species of frogs for 2016 at the Highlands Park wetland- gray treefrog (Hyla versicolor) and spring peeper (Pseudacris crucifer). 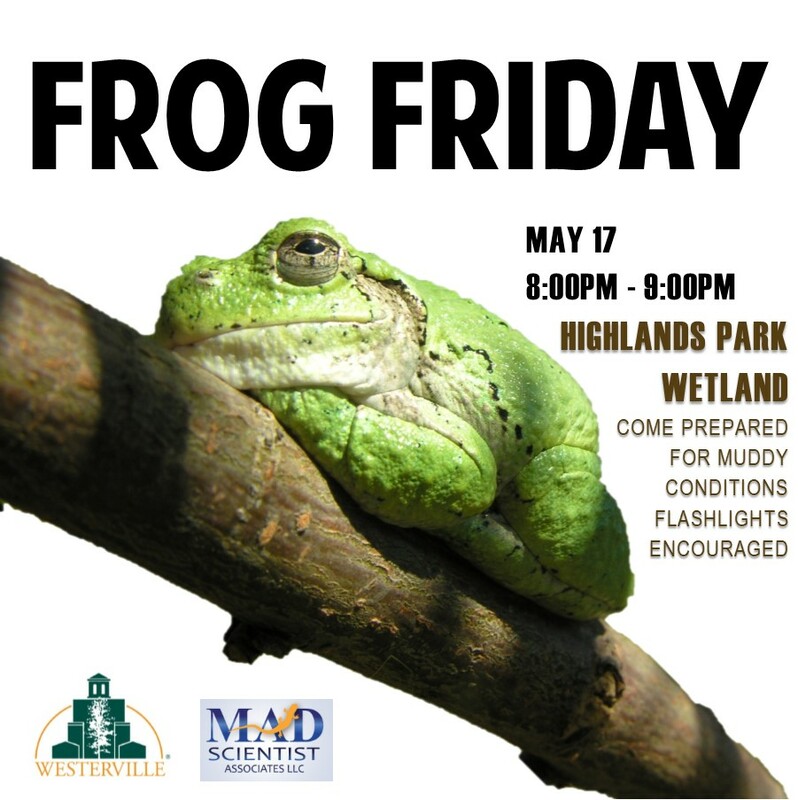 Mark your calendars, we'll be running another FROG FRIDAY at Highlands Park on May 6 from 8:00 - 9:00pm! Mark has reported two new species of frogs for 2016 at the Highlands Park wetland- gray treefrog (Hyla versicolor) and spring peeper (Pseudacris crucifer). Come support your local wetlands this Earth Day by joining MAD Scientist Associates and the City of Westerville for a litter clean-up and planting event at Highlands Park! We will be giving parts of the recently established wetlands some TLC with new native plantings (plugs and shrubs), and performing a litter clean-up. The event will take place on Saturday, April 23rd from 10:00am -12:00 noon at Highlands Park in Westerville. Once all the work is finished, stick around to explore the wetlands. Several species of frog and toads have been observed, as well as herons, hawks, and waterfowl. This is a family-friendly event. All tools needed for planting will be provided. Please wear long pants and boots or shoes you don't mind getting muddy. Refreshments will be provided. This Friday (April 22) is going to be HUGE! For starters, it's officially Earth Day, and to celebrate that, we'll be hosting not one, but two Friday events! Our second event will be hosting another FROG FRIDAY at Highlands Park from 8:00-9:00pm! We anticipate lots of amphibians after a week of warm temperatures and rain. This event is family friendly & FREE!